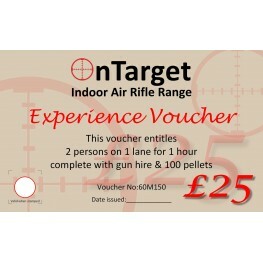 Give an OnTarget Range Gift Experience Voucher! Once purchased your voucher will be posted free of charge to your home address. 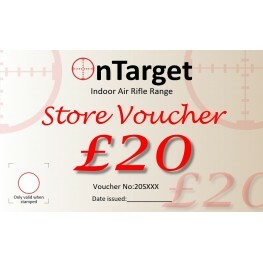 Give an OnTarget Range Gift Experience Voucher!For only £25 you can purchase a gift voucher entitling two person’s to hire a lane, either a Rifle or Pistol, includes pellets & instruction.Once pur.. 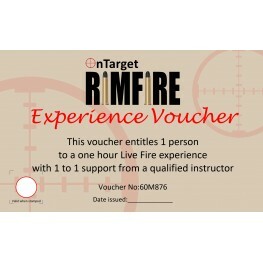 Non Licence holders can experience Live Rimfire shooting by booking an experience session with us, our one hour Live Fire experience gives you the opportunity to shoot a Bolt Action Rifle a lever a.. This voucher can be used to purchase products in store and can also be used towards lane hireVouchers will be posted out to the address registered to the account unless advised otherwise ..